Make sure your nightlight works, because these experiments might make you need one! 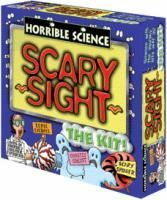 The Horrible Science Scary Sight kit is just what it sounds - exploring ghosts and other ghastly things. Try making a haunted house complete with its own ghost, or a Scary Sight eyeball that really works. Even examine your own skin crawling - a feeling that's sure to become familiar with this kit!